"Nisi iam dies esset exactus." Or "If the day had been completed." dies esset exactus." --Tacitus; videte in Latin and then one word German in the brackets at the bottom of the text. Comments: from The annals of Tacitus referring to the germanic campaign "balanced in their passions and equally balanced in their silence about them"
Zeta function again and this time explicitly. I think you have to know German to solve this riddle. �immelreid�?" S). SB. LIV. <5. 1, 90, 97; ferner XV. @. 389 f(g.: XXVH. 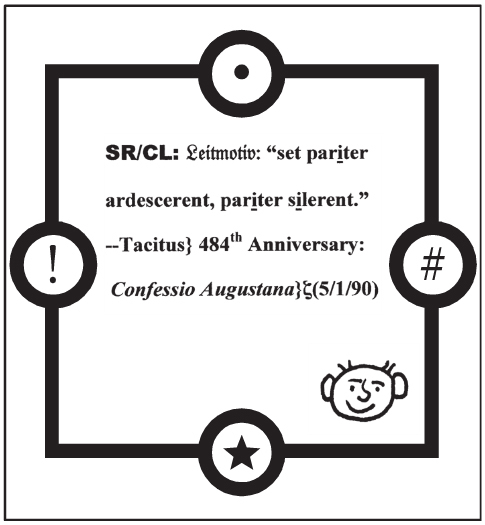 SR/CL:Leitmotiv (keeping to the dominant and recurring theme of tacitus) "if the day were nicely framed." New to this today. If this is all in repetition, please excuse. which is the founding manifesto of Protestantism(June 25, 1530). unanimous in their composure, with so uniform a consistency that one would have thought them to be under command." With this passage being quoted in the clue, "they were unanimous in their fury and equally unanimous in their composure". Look at what happened on May 22nd 2014.
" An explosion occurs in the city of �r�mqi, the capital of China's far-western Xinjiang Uyghur Autonomous Region, resulting in at least 43 deaths and 91 injuries." "General Prayuth Chan-ocha of the Royal Thai Armed Forces announces a military coup d'�tat, following six months of political turmoil." We know that the anniversary referenced is of the Augsburg Confession of 1530, making these guys pretty squarely Lutheran, right? Hi, I'm from Sydney Australia and I heard about this puzzle on some random website so got curious. I saw this one a couple minutes ago and since I have a background in chemistry I recognised the SR/CL as strontium chloride. "Surely it was for my benefit that I suffered such anguish. In your love you kept me from the pit of destruction; you have put all my sins behind your back." of the first persecution of Christians under the emperor Nero.